What Is an ISVforce App? Which Features Can an ISVforce App Use? What Is an OEM Embedded App? Which Features Can an OEM Embedded App Use? What Type of App Should You Build? List the key features of an ISVforce app. List the key features of an OEM Embedded app. Describe considerations when building an OEM Embedded app. Describe the license options for an OEM Embedded app. Being an AppExchange partner is a bit like being a furniture designer. You could design a complete set or individual pieces that work with a client’s existing furniture. To be successful as a furniture designer, you first identify your customers so that you know what they need or want. Similarly, as an AppExchange partner, you figure out who your audience is to have a successful AppExchange product. As an AppExchange partner, you can build either an ISVforce app or a Lightning Platform Embedded app, commonly referred to as an OEM Embedded app. These apps are aimed at different types of customers, so it’s one of the first choices you make. In this unit, you learn the type of app to build based on the customer you want to reach and the functionality you want to deliver. If you want your app to extend Sales or Service Cloud, build an ISVforce app. You can sell ISVforce apps only to existing Salesforce customers. These apps are typically designed to augment Sales Cloud or Service Cloud business functions. Because customers install ISVforce apps into existing orgs, your application can use the Salesforce features that the customer has available. For example, if your app augments the Sales Cloud, you can use Lead, Opportunity, Campaign, and Case objects. Some features are optional, and customers must purchase licenses to access them. If your app depends on functionality available only with specific licenses, such as Customer Communities, customers must purchase those licenses from Salesforce. In the next unit, you learn to identify which features are optional so that you can make an informed decision before adding them to your app. Are you ready to build an app that revolutionizes financial accounting? Or provides extraordinary enterprise resource planning (ERP) for manufacturers? If your app doesn’t rely on Sales Cloud or Service Cloud functionality, you want to build an OEM Embedded app. You can sell OEM Embedded apps to existing Salesforce customers or “net-new” customers who don’t use Salesforce at all. 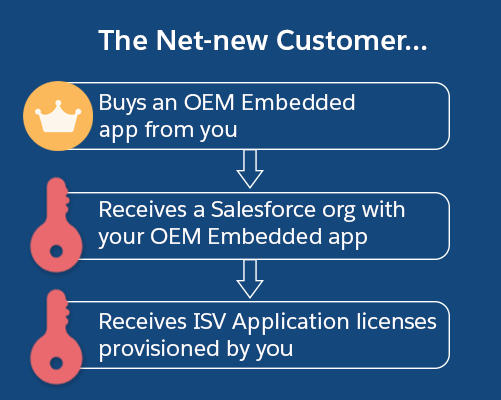 Existing Salesforce customers purchase and install OEM Embedded apps just as they would ISVforce apps. A net-new customer buys your app, and you deliver an org with your app installed. OEM Embedded apps have access to the Salesforce Platform, including standard and custom objects, workflow, reporting, and security. Although they also have access to certain Sales and Services Cloud objects, such as Leads, Opportunities, and Campaigns, they can’t surface those objects to customers. So you must be careful how you use them. If it looks like an OEM Embedded app is the way you want to go, review the full list of considerations. Revisit this list often as you develop your app. A note of caution around OEM Embedded apps. Contractually, Salesforce does not allow you to rebuild Sales or Service Cloud functionality within an OEM Embedded app. Let’s say you start to build an app that seems to have the same functionality as Lead and Opportunity objects. You could be venturing into perilous territory. If you find yourself in this position, contact your Partner Account Manager (PAM). We mentioned PAMs briefly in the AppExchange Partner Basics module. Your PAM can put you in touch with the right people and help you in your journey to becoming a successful AppExchange partner. To have a PAM assigned to you, email isvpartners@salesforce.com. The edition, user licenses, and feature and permission set licenses determine the Salesforce functionalities in an org. When a company decides to purchase Salesforce, it first must choose an edition and then purchase licenses. User licenses give access to different features within an edition. Feature or permission set licenses provide access to features that are not part of the base edition. When customers purchase your app, they are purchasing one or more AppExchange Application licenses from you. You can choose whether those licenses are for individuals or if they are site-wide. When customers purchase your OEM Embedded app, they are purchasing AppExchange Application licenses and embedded Salesforce user licenses from you. Let’s compare a customer’s experience for purchasing and installing your app when they are an existing Salesforce customer versus a net-new customer. If you’ve worked with Salesforce before, you know that Salesforce has many types of licenses. In broad strokes, a license determines what people can do and which data they can see. When building an OEM Embedded app, you can make three types of user licenses available to your customers: Lightning Platform, Customer Community, and Customer Community Plus. Let’s say you are planning to create a ticket management app. The proposed app will track venues, events, and ticket availability. Regular customers and ticket resellers use it to purchase tickets. You want to offer all three types of licenses for the following reasons. What type of Salesforce license type do they need? Your customers’ employees manage venues, create events, designate ticket prices, and so on. Lightning Platform (also known as Salesforce Platform) These licenses enable them to use all the features of your app. OEM Embedded apps always include this license type. Individual ticket buyers search for events, log in, and buy tickets. They gather customer loyalty points that they can use for discounts. Customer Community Customer Community licenses allow ticket buyers to interact with a limited part of the app and see only their own data. Ticket resellers access events that they can resell, view details around the lower and upper limits for the types of tickets they can purchase, and buy tickets. They also have a person designated to manage contractual details, while other employees manage ticket blocks after they are purchased. Customer Community Plus Customer Community Plus licenses allow ticket resellers access to more than Customer Community licenses, but don’t provide access to everything. Also, users with Customer Community Plus licenses can be included in role hierarchy permissions. Your OEM Embedded app can include Salesforce Communities, allowing your customers to work with external users like their customers and partners. And the more users you have, the more licenses you sell! It’s a lot to think about, we know. If you’re considering building an OEM Embedded app, definitely check out our ISVforce Guide for a complete overview of its capabilities and restrictions. Previously, AppExchange partners could offer Partner Community user licenses with OEM Embedded apps. This license type isn’t available to new AppExchange partners, but existing partners who currently sell Partner Community licenses can continue offering them. Before we dive into the remainder of this topic, take a moment to review what you’ve learned about the two types of apps. Source of user licenses Purchased from Salesforce Embedded in application Embedded in applicationCustomers can choose to assign their AppExchange app licenses to users with existing licenses rather than using the embedded user licenses. License type around which app is built Depends on solution and targeted customers. Sales and Service Cloud are most common. As a Salesforce AppExchange partner, the Salesforce app you build is using resources within our infrastructure. To cover our costs, you share a percentage of your revenue with Salesforce. As you sell licenses, you pay Salesforce. Did you notice that sequence? It’s only when you sell licenses that you pay Salesforce, not before. Our percentage-based revenue share enables flexibility in how you price your app to help you grow your business. For example, you can have a tiered approach. Customers who purchase over 100 licenses get a 10% discount, and customers who purchase over 500 licenses get a 15% discount. 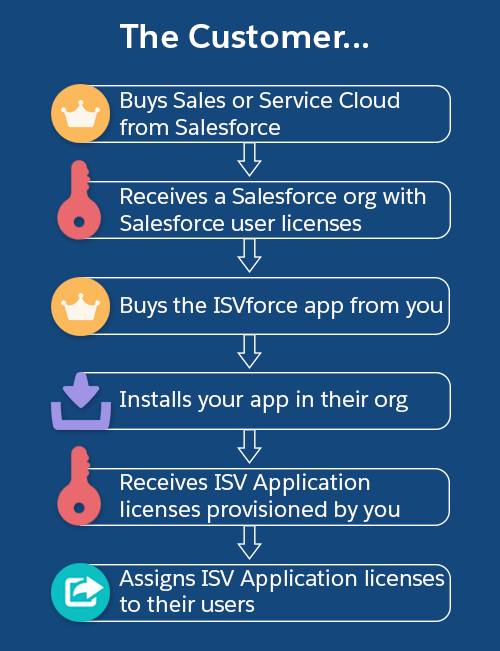 ISVforce app customers have already purchased user licenses from Salesforce, so our costs are largely covered. Therefore, if you build an ISVforce app, you have the most flexibility in how you choose to price your app. The situation is different for OEM Embedded apps. Remember those embedded Salesforce user licenses that are part of your app? We have a higher cost because they are included in your app. Though you can still choose to discount your app, there are guidelines around pricing for embedded licenses. To learn more about how pricing works, contact your PAM. Now let’s look at a few scenarios and do some decision-making. The critical question for choosing the type of app to build is “Does the app augment Sales or Service Cloud?” If we decide to build an OEM Embedded app, we review who will be using the app to see if we want to include some type of Community user licenses. Does the Event Management app augment Sales or Service Cloud? Although your customers might use sales or service functionality, it’s not a requirement for using your app. So an OEM Embedded app is the best choice. You also want to include Customer Community Plus and Customer Community licenses for suppliers and customers. The Deal Progress Forecaster app augments Sales, and it can’t stand on its own. So you want to build an ISVforce app. Your customers already have Sales Cloud licenses. This app enhances the Service Cloud experience, so you want to build an ISVforce app. The Service Cloud Console is included with the Service Cloud licenses that your customers have already purchased, so your app appeals to a broad audience. To build functionality that enhances or naturally fits with Sales or Service Cloud, build an ISVforce app that you can sell to existing Salesforce customers. If the app you want to build has new functionality and can reach beyond Sales and Service Cloud customers, build an OEM Embedded app. You can choose to embed Lightning Platform, Customer Community, and Customer Community Plus licenses in your app. But remember, don’t recreate Sales or Service Cloud functionality within your OEM Embedded app. Regardless of the app type you build, as you design the app, keep in mind the features that are available in your target customers’ orgs. The next unit takes you further in your decision-making. Take a deep breathe. Do the quiz. (You’ll ace it!) And off you go!